Get an inside look at the key disruptive technology challenges, priorities, and investment areas/timeframes of 950+ shared services, finance, HR, and automation executives. Be the first to secure exclusive sponsorship and exhibition opportunities through Thought Leadership Sessions, Benchmarking Workshops, Innovation Think Tanks, Interactive Discussion Groups and more. Download the Solution Providers Guide to see how you can get involved today! To request a copy, email us at Maricarmen.Gonzales@iqpc.com. 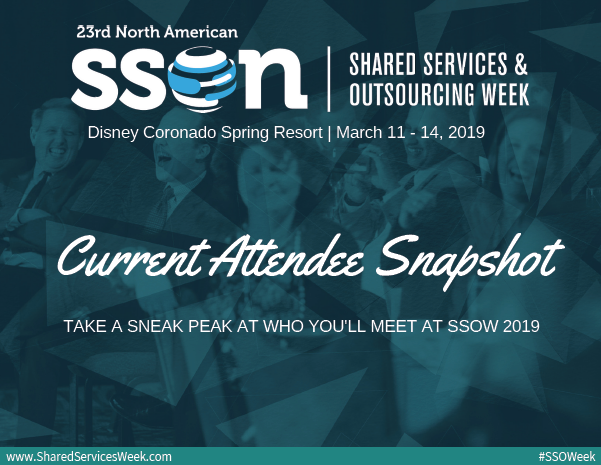 Enlighten the workforce with your automation solution at Shared Services & Outsourcing Week! Check out the Report to see where our attendees are investing and who they are. Lead interactive discussions, workshops, and tracks exploring the intelligent automation landscape at SSOW to eager buyers. For copy via email, contact Sponsor@iqpc.com. Enlighten the workforce with your financial technology solution at Shared Services & Outsourcing Week! Check out the Report to see where our attendees are investing and who they are. Lead interactive discussions, workshops, and tracks exploring at SSOW to eager buyers. Enlighten the workforce with your HR technology and solution at Shared Services & Outsourcing Week! Check out the Report to see where our attendees are investing and who they are. Lead interactive discussions, workshops, and tracks exploring the HR landscape at SSOW to eager buyers. Download the 2018 Pre-Booking Form and explore different sponsorship levels and opportunities available to get your services and products in front of future customers in 2018. Our Attendees are Looking for You! Put yourself in front of 950+ Shared Services, GBS, Finance, HR, Automation executives ready to hear what you have to say about how you can help them reach their business goals. Grow with us at Shared Services and Outsourcing Week and expand your customer base.